In the last few weeks we’ve been searching for the very antithesis of Grumpy Cat. Yup, we’ve been on the hunt for the nations happiest feline: a Happy Cat that will help us explain why the O2 Refresh tariff makes customers … well, happy. Launched with the #O2happycat we received 100s of entries to @O2, all hoping theirs would be the chosen one. 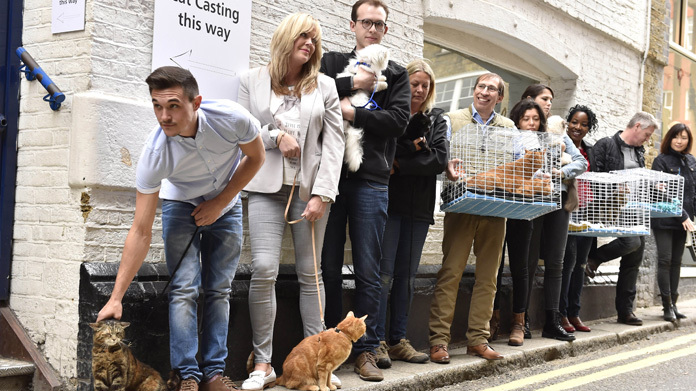 So it was that – with a little help from cat lover Sarah Harding – we narrowed it down to 20 cats and held an industry-first cat casting in Pineapple Studios. If we’re honest, the whole thing was a bit like hearding cats, but despite any urge to cuddle the stars, we managed to stay professional and get fantastic photography and video content. The results made us purr as we secured 8 national pieces of coverage, including a huge DPS in The Guardian Eye Witness, a philosophical piece in The Times (print and online), a stonking mention on ITV’s FYI Daily, as well as Metro (print and online) and the Daily Star. With stacks of online coverage including Independent, Daily Mail, Heat World and Reveal in just the first part of the campaign we couldn’t help fe-line great today.